Sarri stormed down the tunnel and snubbed Pep Guardiola’s handshake after they were thrashed 6-0 by Manchester City. Sergio Aguero struck a hat-trick, Raheem Sterling got two and Ilkay Gundogan bagged one himself while Chelsea fans called for Sarri to be given the boot. But the future is less clear for Sarri, who said a Sky Sports reporter must ‘speak to the club’ if they want to know the latest on his position. Sarri was appointed in the summer to replace Antonio Conte as the Chelsea owners wanted a more easy-on-the-eye style of football. But with their top four challenge dwindling, Neville now thinks Chelsea have a make-or-break couple of days to see if they want to stick to their guns. “If the ownership of the club want to see a better level of football, or a higher quality of the possession game, they are going to have to live through the pain of the change,” he told Sky Sports. “Now’s not the time to go weak on that. What we will see in the next 24 to 48 hours is whether Chelsea have the belief that they do want to follow through with it. “In the past, they’ve changed the managers, they’ve changed Scolari, Villas-Boas. Are they going to stick with Sarri? “If they want this type of football for the long term, they are going to have to live through the pain of the change. Jamie Carragher was appearing alongside Neville at the Etihad and he believes the club are ‘obsessed’ with a fluid football style. But there’s one problem – that has now left the club ‘weak and soft’. “Chelsea have an obsession at the top of the club. They always wanted Pep Guardiola, that type of football, that’s what Roman Abramovich fell in love with football, we’re told,” he said. “Chelsea have been so successful with a big, powerful team. Think Mourinho first time round and second time round. Conte has just been here. 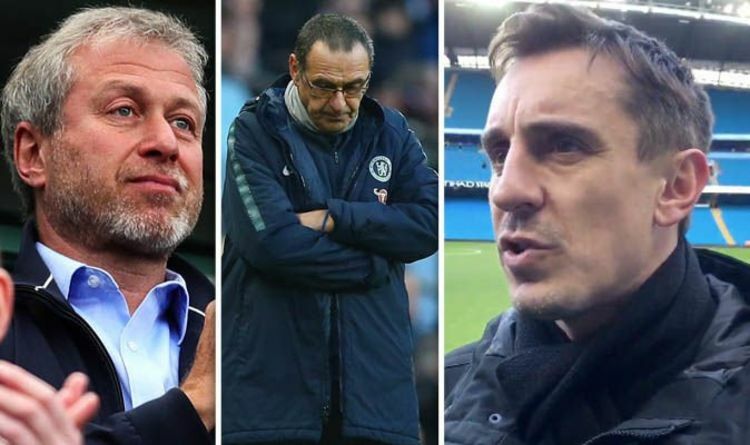 “Wherever they go and get this type of manager, with Scolari, Villas-Boas and now Sarri, it doesn’t seem to work. They seem obsessed with going back to it. “Forget today, they lost 4-0 at Bournemouth, the performance against Arsenal, the performance against Spurs, he’s making Chelsea weak and soft. Chelsea are now down in sixth having fallen behind Arsenal on goal difference after the six-goal hammering. Graeme Souness accused the players of giving up and said: “They were ruthless, devastating and clinical. City were fabulous. “I don’t know how to describe it but I watched the first five minutes and I thought Chelsea would have a real go. “Some of the goals were avoidable but I was gobsmacked at the end with the way Chelsea seemed to give up. That’s an accusation they will have to deal with from more than me.